"Or to put it in the terms in which we started out: It is possible to read the Bible from a number of different angles and for various purposes without dealing with God as God has revealed himself, without setting ourselves under the authority of the Father, the Son, and the Holy Spirit who is alive and present in everything we are and do. "To put it bluntly, not evereyone who gets interested in the Bible and even gets excited about the Bible wants to get involved with God. "But God is what the book is about." Eugene Peterson is concerned that we have learned to read the Bible for intellectual (theological) stimulation, for moral guidance to the good life, and for personal inspiration and comfort--all of which are good things. Yet, each of these purposes falls woefully short of personally relating to the personal, relational, interactive and present living God. I know people who really like the Bible: like to study it, like to debate it, and like to almightily defend it. Yet, all their biblical bluster is a way to not have to deal personally with the Living God and be personally changed into a more Christlike person. Christianity for them is an argument to be won or lost, not a relationship with the Triune God to be lovingly lived. Sad. 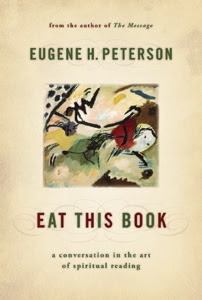 Eat This Book:A Conversation in the Art of Spiritual Reading is the third volume in Eugene Peterson's series of books on Christian Spirituality. Eat This Book was preceded by Christ Plays in Ten Thousand Places and The Jesus Way. Correction: Eat This Book is actually the second volume in the series. The Jesus Way is the 3rd. Yes. I guess this is saying that the Bible has a beauty all its own which can sidetrack us from the Beauty that gave/gives it to us. I'm sure I've been guilty of what Peterson speaks of here many a time and to a significant degree, though it seems that God helps us to see beyond the sacred Word, to seek him. On the one hand, there are those (I'm sure all of us at one point or another) who are interested in or excited about the Bible but do not want to get involved with God. On the other hand, there are those who are interested in or excited about the Bible and think that they have found God, and are then "worried about" anyone who claims to be a Christian but don't hold to their view of God. With Meister Eckhart, "I pray God to rid me of God." So I agree, read the Bible to get involved with God, but don't turn (your view of) God into an idol. Bibliolatry is highly prominent in our times. The Bible points us to community with the living God and each other, not an argument. Thanks John for highlighting that and showing us that Peterson shares the same direction. Christianity for them is an argument to be won or lost, not a relationship with the Triune God to be lovingly lived. Sad. Christianity is an intimate relationship of love for, and restored life with, the Triune God; it is never an argument to be won or lost. Praise God! I, too, was caught up short on some of the "ways" we read the Bible IN ORDER TO avoid God. Of course, our view of God may be foreign to the self-revealing God of the Bible primarily in the person of Jesus of Nazareth. That would be a sad idolatry. How would know if one's view of God based on the study of the Bible was idolatrous? I agree that bibliolatry is prominent in our day under the guise of "defending the Bible." Many have replaced the God of the Book with the Book itself. It's safer. I like the way you turned the statement to a positive one. Good work, and thanks! Thanks for the summary, John. I'm still waiting for my copy to arrive, looking forward to reading it. Just a minor detail: "Eat this book" is actually number two in the series, "The Jesus Way" came out earlier this year. I spent a Summer reading this book and meeting with a small group, eating and digesting The Book in community. It was among my favorite small-group experiences, scoring a solid 10 on the nitty-gritty-applicability scale. I'm just beginning to soak in the truth that the Bible is not about me or my problems primarily. God is the protagonist in this grand story and the Sacred Text tells us about His great mission. To have the best effect, I have to cast myself into His story and be swept away by the ongoin work of redemption. Then my problems will begin to resolve. Thanks for the comment; and you're correct about the order of the books in the series. My goof. It sounds like a wonderful excursion into the community-meeting-with-God. Thanks for commenting. How would one know if one's view of God based on the study of the Bible was idolatrous? I think that our view of God becomes idolatrous when we think that we have comprehended the incomprehensible God. We can only talk about God in metaphors, and we must realize that by using one metaphor we aren't using other metaphors. And we must be open to using other metaphors, lest our metaphors stagnate and become violent. A recurring theme in the Old Testament is "The LORD is compassionate and gracious, slow to anger, abounding in love" (Ps.103:8). See Ex 34:6; Nu 14:18; Neh. 9:17; Ps. 86:15, 145:8; Joel 22:13; Jonah 4:2; Nahum 1:3. These seem to be declarations of character without the use of metaphor. For a human being to affirm, accept and live by the self-revealed nature of God as expressed in Scripture need not idolatrous. Have I truly comprehended God? Yes. Have I exhaustively comprehended God? Never. We may be using different descriptions of "metaphor" and "comprehension." On the one hand, by comprehension I was trying to say that we cannot encompass God (have a complete realization and knowledge of God) in our concepts of God. I didn't mean to say that we cannot understand God at all, we can certainly apprehend God. On the other hand, it seems to me that words like "compassionate" and "gracious" are dead metaphors that we are simply unaware of. The Hebrew for "compassionate" is rachuwm which means "to be soft" which is certainly a metaphor. Even the English "compassionate" means to "suffer with" but is used in a metaphorical sense. And the Hebrew for "gracious" is channowth which comes from the word that means "to bow down." The English for "gracious" comes from one of the three sister goddesses (Kharites), bestowers of beauty and charm. Your example also uses a kinetic metaphor for anger and a quantitative metaphor for love. But these aren't exactly what I am concerned with. It is the metaphors for God from which we define what we mean by "compassion," "grace," "slow to anger," and "abounding in love." Psalms 103:8 means something different in relation to a God described as a Father or a Warrior than it does if we speak of God as a Mother or a lover. I'm not necessarily saying that any of these metaphors are wrong, I'm just saying that we have to be open to talking about God by using different metaphors. I'm not uncomfortable with the Hebrew, Aramaic and Greek terms used in the creation of Scripture; and I'm not under any compulsion to create new metaphors for God other than the ones used by the biblical authors. Granted, language evolves and meanings change, but I think that if we follow your thinking out, we end up unable to communicate at all. I say "stone" and you think "feather." The God of the Bible is a self-revealing God and is at ease in revealing God-reality in the limited, frail medium of human language. Words do have comprehensible, apprehensible meanings, even ancient ones.